The University of South Florida will see some major changes over the next 20 months. First, it has to replace Judy Genshaft, who retires as President effective July 1, 2019. Then, the state-mandated deadline for USF to consolidate its three campuses under a single accreditation falls exactly a year later. 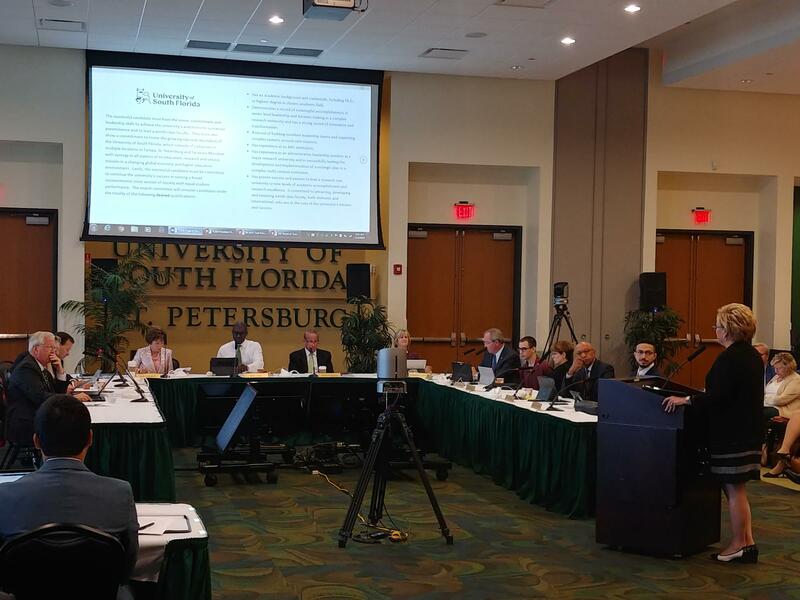 Both issues were on the minds of the USF Board of Trustees at their final meeting of 2018 in St. Petersburg on Tuesday. Chairman Brian Lamb said he's not worried about taking on both challenges at the same time, as they have a plan. The board first approved a job description for the presidential vacancy. USF put out a survey to faculty and staff, students, alumni and community leaders. Search Committee Vice Chair Rhea Law said they received almost 800 responses, including more than 350 from current students. That feedback, along with consultants’ advice and feedback from sessions held at all three campuses, went into the job description. However, Law said it won't mean anything until they see who applies. Law said consultants will next be reaching out to prospective applicants. Recommendations would be presented to trustees by the end of the first quarter of 2019, and they hope to decide on a replacement in the spring. That replacement will also have to be approved by the Florida Board of Governors. Trustees also received updates on the consolidation of the accreditations of the three USF campuses from both the Consolidation Planning and Implementation Task Force and Huron Consulting, which is assisting the university in the process. While the plan is moving forward following a number of Task Force meetings and town hall-style listening sessions in Tampa, St. Petersburg and Sarasota-Manatee, concerns remain about the timetable. Final reports from both the Task Force and USF leadership are due Feb. 15, 2019; the Board of Trustees must adopt an implementation plan and submit it to the Florida Board of Governors by March 15. As a result, trustees decided to schedule an extra discussion in January, ahead of their next scheduled committee meetings Feb. 12. The board also approved Genshaft’s annual bonus of $295,500 for the 2017-18 school year. The committee voted in October to give Genshaft the entire $210,000 allowed, which the board approved Tuesday. Lamb approved 95 percent of the $90,000 he was allowed to reward. Genshaft’s bonus is based on USF's performance in a number of goals during the 2017-2018 fiscal year, including research, student success, strategic initiatives and fundraising. During the fiscal year, USF achieved a trio of Genshaft's long-term goals: attaining preeminent status, placing it alongside the University of Florida and Florida State; joining the Phi Beta Kappa academic honor society; and reaching the $1 billion mark in USF’s “Unstoppable” fund-raising campaign. University of South Florida officials are not waiting for Governor Rick Scott to sign a higher education bill before they start planning to consolidate their campuses under one accreditation. The University of South Florida System Board of Trustees on Thursday awarded President Judy Genshaft a $263,175 performance bonus.